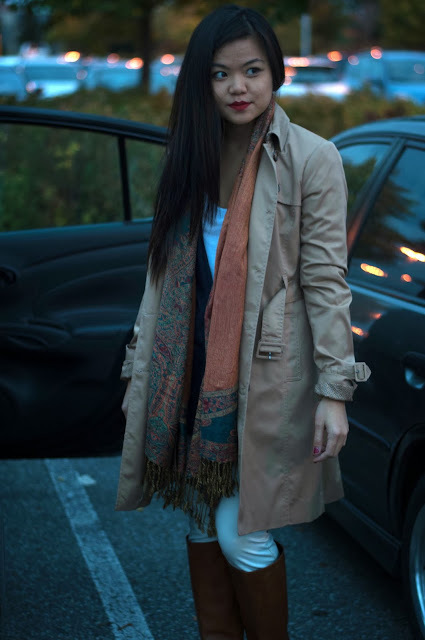 With the fall season in full swing, below are some of my favourite autumn looks, thought starters on ways to style them, in addition to some product recommendations. Thank you to Steven, my dear childhood friend for these great photos! Can't wait to start working on Part 2! 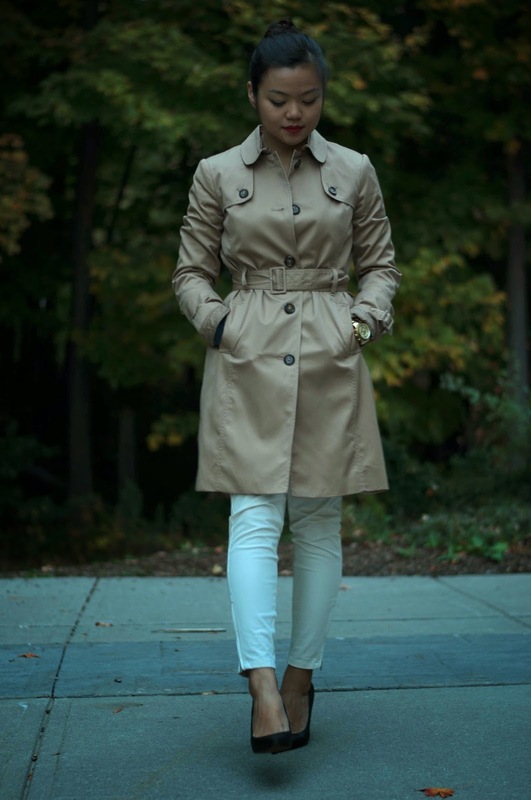 From cotton to wool, classic to trendy, the trench coat is the perfect finishing touch to any outfit. 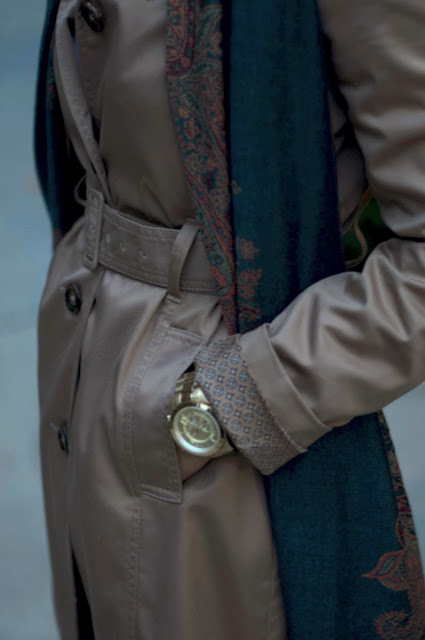 A trench is extremely versatile and will work for any occasion - throw it over a crisp white oxford and cigarette pants for day-time business chic then drape it over your LBD for a night out on the town. A trench coat is timeless, but I've been seeing tons of variations that incorporate luxe fabrics such as leather detailing in addition to graphic colours for a modern twist on the iconic khaki. Below, I styled it in 3 different ways - business, weekend and evening appropriate! What I'm wearing: JACOB trench overtop a MANGO boyfriend cardigan, Vero Moda tank, JACOB zippered pants and ALDO leather boots. To go from day to night, I replaced my pashmina and boots with a (faux!) fur collar from H&M and Sam Edelman pumps for a dose of glam. 2 | The Black on Black...on Black. Kathleen (Fashionable Laughter) recently wrote a post about her love for this colour combination and I could not agree more! Okay, let's be real - I'd wear black on a 35 degree day in the middle of July, but that is not to discredit how chic and season appropriate this is for the fall and winter months. What is there not to love? Black is easy, slimming and matches everything. However, an abundance of black can make you look harsh or one dimensional. If you're going to wear all black, mix and match different fabrics and textures to add visual interest, making the outfit look more thoughtful and carefully put together! Below, I combined tweed, leather, ponte and satin with gold detailing for subtle shine. What I'm wearing: ZARA blazer with silk lapels, over a H&M blouse and Smart Set skirt. The tote is from Michael Kors and the glasses are Karen Walker. From trousers, to jackets, to skirts to shoes, obviously the possibilities are endless. However, I have a soft spot for leather so below are links to some pieces I'm particularly fond of! 3 | The Coloured Blazer. For those who think blazers are only 'meant for work', I hope you'll reconsider! There is more to life than just a black, tailored suit jacket (although I believe everyone should still have one!). Blazers come in a plethora of silhouettes, ranging from cropped, to boyfriend style, to relaxed, to tuxedo cut. Fit is one thing, but colour and texture is a whole other story. Bottom line, a blazer does not have to be a snooze-fest. This fall, enhance your wardrobe with pieces in rich fall hues such as burgundy, oxblood, navy, plum or even a winter white. A fall-toned blazer will add a gorgeous burst of colour to your day and will make you feel polished without feeling too 'corporate'. What I'm wearing: Cropped, open-front blazer from Costa Blanca over a vintage blouse and paired with wool shorts from Joe Fresh. I finished off the look with a Kate Spade purse and pearl necklace from H&M. With all that said, what are your go-to fall items? There you have it! I hope you enjoyed the first half - I will be back for more!